Because a kid should never have to wait for a bedtime story! This list is about our Website, such as managing your books, your account page, navigating the store and info about our company. What is the typical age of a child that storytellers are reading to, on Be There Bedtime Stories? This could be fun for kids of all ages! Afterall, it’s about connecting families that are geographically far apart. However, kids that are not yet comprehensive readers may be more common for our storytellers. This is a relatively new experience for families and kids, so let us know what you think! Take a look at the age group category or book length category in the store to find the right story for your child. Can I practice reading the story before I send it to my granddaughter? Most certainly! Even after you begin recording the story you can start over as often as you wish. Just read the story as if you were sitting at their bedside. A child doesn’t expect an award-winning performance, just a bedtime story. It’s the bond with you as their family that counts, so give it a try! Do I need a physical copy of the children’s book to use Be There Bedtime Stories? It’s the experience of the bond you make while storytelling that we aim to deliver with our technology – the book is included, right there on your computer screen! We enable you to say more than just goodnight with questions, comments, sound effects and hand gestures, no matter how many miles away. Of course, we can’t quite deliver the sensation of holding the brightly colored, hard-bound, grape jelly resistant version of a children’s book. So in that case, you can order a print copy direct from the publisher at checkout, and supplement the memory for that child! Can I read a story on Be There Bedtime Stories in a live video interface, in real-time? Hopefully soon! This is one of many enhancements that we have up our sleeve for subsequent development phases. Remember, it’s the experience of the bond that matters most! Kids hardly care what you look like – they just care that YOU’RE THERE! And it’s a learning experience as the children follow the written words in the book as you read. After a few times, it will feel natural to look up from the page you are reading and into the camera, just as you would look at their face while reading from them at bedside. Say more than just goodnight with questions, comments, sound effects and hand gestures, just as you might if you were in the bedroom. Nobody can replace your voice and face as Grandma to your grandson, or daddy to your daughter – whether in person or on a computer screen. Take a look at our demo video to learn more. Do I get a copy of the story after I record it? Yes, well, digitally….! The video recording and the bedtime story will be stored on your account page and in your child’s bedroom/account page [on our website]. You can access the story at anytime, and so can the child. And, when you finish reading, you can purchase a printed copy direct from the publisher or your favorite bookseller and supplement the memory for that child! Can I record the story again, after I send it the first time? [Top] Sure, why not. Our system will recognize you have already purchased that story and allow you to send the story again within 30 days of the first recording. I’m not sure how I feel about children reading books on a computer… [Top] Our intention is to connect families that are geographically far apart – which means that more family members can ‘be there’ in a child’s life. We have no intention of replacing books, we just think that video storytelling is a great way to connect. Not only will they recognize you when you visit, you get to be active in their development! Bedtime Stories happen everynight! So, by introducing a video storyteller from other family members, just one or two nights each week, there is a greater experiential value from the sacred routine of bedtime stories in addition to the literacy benefits! Can my granddaughter watch the story more than once? [Top] Indeed! The recording is accessible from her virtual bedroom/account page as many times as she wishes – forever. In fact, many parents face the issue of having to read a child’s favorite book over and over and over again. You’ll be doing them a favor and giving them a break. How do I send the story to my grandchild? [Top] That’s easy – we’ll do it for you! After you approve of your recording and pay for it, then we will alert the child that a story awaits them on the bookshelf of their virtual bedroom/account page. The child’s parent will receive that email alert about your new bedtime story and click a link in that email which takes them directly to your recording on the Be There Bedtime Stories website. In just 2 clicks, they will be watching you read them a bedtime story on their computer! What is your return policy? [Top] That’s an easy question! We’ve provided you with the opportunity to preview your recording before you pay, so you can ensure that you are satisfied before you even hit ‘purchase’! However, if there is any other reason that you ended up creating an unhappy moment, we can offer you a refund, as long as it is within 30 days of your recording. You can find more information on contacting customer support here. Do Webtime Stories play on an iPad or tablet device? [Top] Yes! You can now record or watch Webtime Stories using your iPad or iPad mini. Once you purchase a book from the bookstore, simply login to the Be There! app on your iPad with the same login info as your ID on the website, and your book will download to your device to record and send from within the app. If you have received a storylink from a storyteller to watch a Webtime Story, simply login to the Be There! app with the same email address in which you received the link. This list provides fast and simple tech support, troubleshooting your webcam or iPad or general issues during the recording process. Do I need to download a special program or use a Skype™ account to READ or WATCH a bedtime story to/from my granddaughter? Be There Bedtime Stories does not use Skype™ to produce your story recording. We use Adobe Flash technology with your webcam. You will need a webcam to record your story but you do not need to have a Skype™ account to send it to your granddaughter. Your granddaughter does not need a webcam or a Skype™ account to view the story you have recorded, either. Check Your Flash version Here! Do I need a Webcam to Be There at Bedtime with my grandson? Yes and No… You can use either a webcam or an iPad camera to record your story. However, your grandson – or niece, nephew, daughter, etc… does not need a camera to receive and watch your story. It’s pre-recorded and saved to your account, so they can watch from any computer connected to the Internet, or they can watch from the Be There! app in the iPad App Store. If you don’t have a webcam, it’s easier than you may think to get one! Webcams are widely available and affordable, despite the iPad revolution. You can find a good model for as little as $20-$30. Just visit Amazon.com or your favorite shopping site see what models get high marks from other customers in the reviews. Have some questions about recording on your iPad? No sweat! Visit our iPad troubleshooting tips, including a direct link to our support desk. The book and/or video is cutoff in the display, how can I change the view? Piece of cake! Try F11 on your keyboard for full screen mode. Then just hit F11 again to exit the full screen mode. MAC users, just drag the bottom corner of your window to enlarge. Easy, huh!? How do I know if my computer will work with Be There Bedtime Stories? Same as the webcam, ANY computer should work. However, Be There Bedtime Stories will not work if you are accessing the Internet via dial-up modem. You must have DSL access to the Internet, at minimum. Can I use a video camcorder to record the story? No. Our program works with the settings of your webcam and we are unable to edit a recording taken by a camcorder. Besides, using your webcam makes it easier to read the story right off your computer screen – give it a test drive for free and see for yourself! What is this? What happens if I select Allow? We use Adobe Flash for our webcam video technology – you will not experience this if recording on an iPad. Before the Flash application can record your video bedtime story, we need your approval to access your webcam and microphone so that we can see what your webcam sees. By clicking ‘Allow’ you are telling the Flash program that it is ok for the www.betherebedtimestories.com website to access and utilize your webcam and microphone in order to create a video recording. If you select Deny, then we cannot access your webcam and microphone and will be unable to record a video bedtime story. No problem! Just close this popup window and then click the ‘refresh window’ button in your browser (a circular arrow symbol in your browser toolbar). You’ll see the Allow/Deny box again. Great! Then you won’t see the Allow/Deny box upon return to our website, so just click ‘Yes’ and move on to the next step. During Webcam Video Setup, why don't I see an image in the box/video frame? Did you click ‘Allow’ on the previous screen? We can’t view or display an image captured by your webcam if you didn’t. If you clicked ‘Deny’ or didn’t see a box, please go back and try again. If you close this window and then click the refresh button in your browser (a circular arrow symbol at the top of your browser) you’ll go back to that first step. For more information on camera and microphone access, click here. Is the correct webcam selected in the dropdown list? 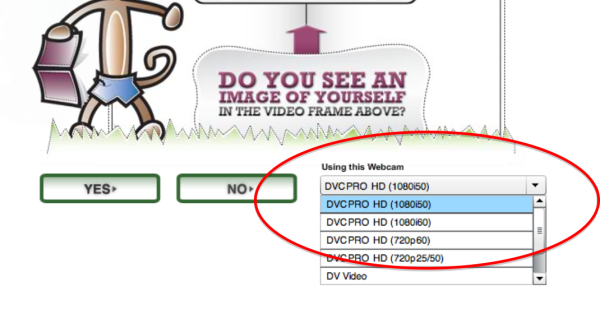 On the setup page just after the Yes/No question there is an option setting ‘Using this Webcam’ that lists the webcam drivers/equipment currently available on your system. If you see more than one option listed there, try selecting each camera one by one. Even if you have a webcam integrated into your laptop or notebook screen, you may find that the ‘USB’ webcam from the list of drivers will work. Just wait 5 seconds after you choose a different webcam to see if your image appears. Do you have a webcam and is it plugged in or turned on? A webcam is required to record videos on Be There Bedtime Stories. If you have a laptop and it includes webcam technology, you will normally see a small camera lens (about the size of an eraser head) located in the middle of the top of your monitor/screen. On a desktop PC or Macintosh your webcam may be a small attachment that is plugged into one of your USB ports. All webcams will normally have a light activate, which indicates that it is turned on and ready to work. If for any reason you believe you may have disabled or turned off your webcam, please consult the documentation that came with your laptop or the webcam you purchased. 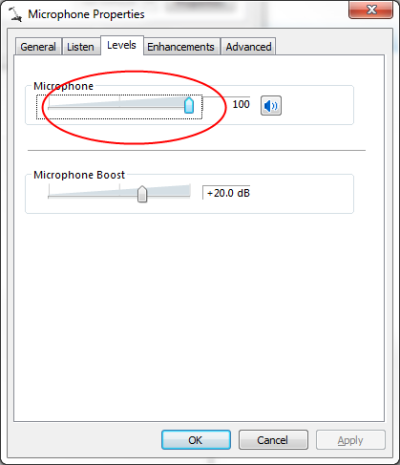 During webcam audio setup, when I speak the sound meter doesn't move at all? When I speak the sound meter doesn’t move at all? Did you click ‘Allow’ on the first screen? Is the correct microphone selected in the dropdown list? On the setup page just above the Yes/No question there is an option setting ‘Using this microphone’ that lists the microphone drivers currently available on your system. 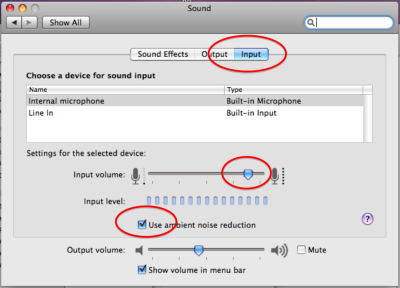 If you see more than one option listed there try selecting each microphone one by one. 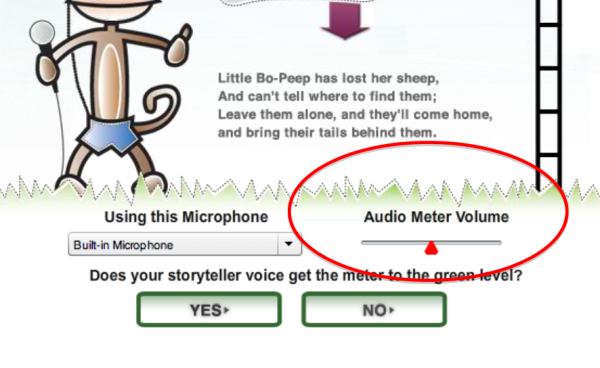 After you have made your new selection, try speaking in your Storyteller voice again and watch the audio meter. The sound is too low. How can I get the meter to go into the green? On the webpage: To do so just move the red triangle (audio meter volume) to the right. Then try speaking again. The sound is too high! How can I adjust the meter to stay within the green? How do I send my bedtime story to my grandchild? That’s easy – we’ll do it for you! After you approve of your recording and pay for it, you’ll enter an email address to send the video to. Then, we will alert the child that a story awaits them on the bookshelf of their virtual bedroom/account page. The child’s parent will receive that email alert about your new bedtime story and click a link in that email which takes them directly to your recording on the Be There Bedtime Stories website. In just 2 clicks, they will be watching you read them a bedtime story on their computer! Contact Customer Service or Tech Support Direct!